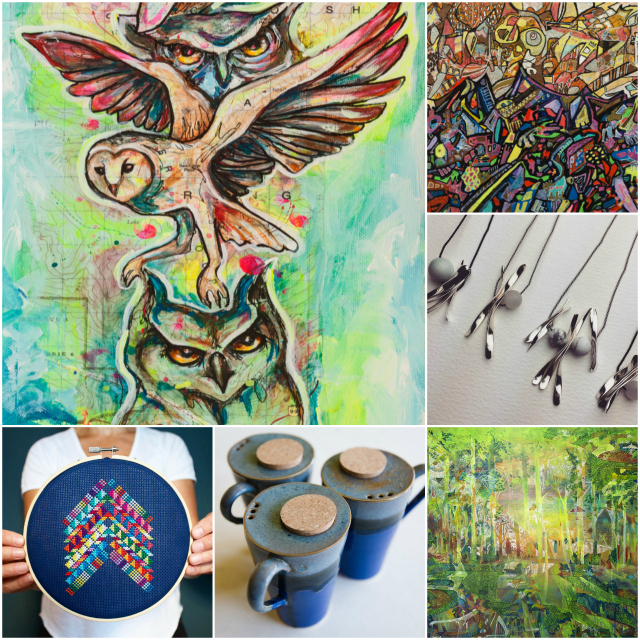 The Little Mountain Shop on Main Street presents Versatile, a fresh and cleverly-curated gallery event that will pop-up this month and again in December. Versatile plays host to both established and emerging artists, designers and makers predominately from the Sea to Sky region. It will be Vancouver’s premiere opportunity to see this as yet un-taped vein of talent who are debuting in the city, as well as select established artists who will be presenting new collections for the event, said Versatile founder and curator Stewart Hughes. Nine artists and makers will participate in a show including Meghan McCrone (pottery); Vanessa Stark (painter mixed medium); Valerie Nagy (dress maker); Diana Watters (contemporary graphic cross stitch); Lan Yao (painter); Caroline Miller (jeweler); MaryMary (street artist/stencil artist/screen printer) and Amanda Jane Green (jeweler). Versatile was born out of the frustration the Welsh native said he felt seeing talent simply not getting a broader platform. “All this great work I was seeing I felt needed to get out into the hands of collectors and people who simply enjoy incredible art and design,” said Hughes. Located in the popular Little Mountain neighbourhood, between Riley Park and Mt. Pleasant at 28th and Main, Little Mountain Pop-Up is a beautiful storefront that can be used for retail, gallery exhibits, yoga classes, and small events. Check out their calendar for upcoming events and pop-ups.